Chairman Webb was re-elected on December 1, 2018, to serve a sixth term as Chairman of the RPA after leading it to historic victories across the state, gaining seats in the state house and state senate and solidifying a majority stance in both; sweeping all seven constitutional offices including governor and lieutenant governor; and rounding out an all-Republican federal delegation from Arkansas to the U.S. House and Senate. For the first time in 140 years, Republicans are the majority party of Arkansas. ​Doyle has served as the RPA Chairman for nine years -- the longest tenure in the state party's history, and the most senior serving Chairman among all 50 states, with the benefit of that continuity evident in the party's current unprecedented strength. He is also the second most senior chairman within the Republican National Committee. ​Of note, Doyle serves as the General Counsel to the Republican National Committee in conjunction with his state chairman responsibilities. Chairman Webb is the first Arkansan to serve as an officer of the RNC. Sarah serves as the Republican Party of Arkansas' Executive Director. She is an alumnus of Arkansas Tech University where she earned her Bachelor of Arts in political science and a master's degree in science in College Student Personnel. As a result of her grandfather, Judge Bud Harper, serving as one of the first county judges in the state of Arkansas, and her grandmother's lifelong public service, Sarah Jo became interested in politics from an early age. She became actively involved with the Republican Party of Arkansas while in college, serving as chairman of the Arkansas Tech College Republicans during which time she was active in many local and statewide campaigns. 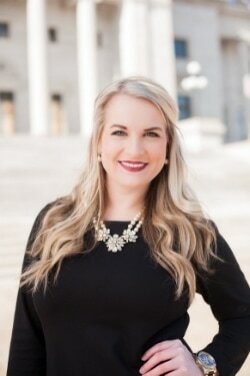 She has previously served as Political Director for the Third and Fourth Congressional districts, as well as Administrative Assistant for Commissioner of State Lands, John Thurston, and Field Director for Arkansas Victory in Central Arkansas with a primary focus on Saline County. Ashley serves as the Finance Director at the Republican Party of Arkansas. Prior to becoming the Finance Director in 2016, Ashley served as the Deputy Finance Director at the RPA since 2014. Rusty Jackson serves as the Victory Director for the Republican Party of Arkansas. He is a native of Benton, AR and a graduate of Bryant High School. Jackson graduated from Arkansas Tech University with both a Bachelor’s and Master’s degree in History. At Arkansas Tech, Jackson became involved in College Republicans where he served in many roles throughout the years such as Chairman, and First Vice Chairman. In 2016, He served as the Field Director for the Republican Party of Arkansas in the Hot Springs area. As Field Director, Jackson helped to elect Republicans in Hot Springs, Arkadelphia, Malvern and Mena. Prior to his employment with the Republican Party of Arkansas, Jackson worked for the Boy Scouts of America. In his free time, Rusty enjoys traveling and spending time friends and family. ​Stephen serves as the Communications Director for the Republican Party of Arkansas. He is a prior service U.S. Marine Infantryman and a graduate from the University of the Ozarks with a Bachelors’ Degree in Political Science and Economics. In conjunction with his education and military obligations, Stephen founded the College Republicans organization on campus. His active participation with the Republican Party fostered the largest CR organization in Arkansas in relation to student body enrollment. He participated in various local, state, and national campaigns. Upon graduation, Stephen became the Campaign Manager for 69th District House Representative Aaron Pilkington, resulting in a landslide victory in a predominantly Democrat held area. 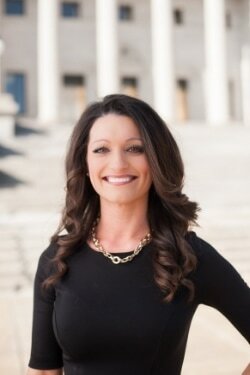 ​Bea serves as the Executive Assistant for the Republican Party of Arkansas. She comes to the Party after 40 years of banking experience. She was in management and managed several banks and owned her own mortgage company. She retired as a mortgage loan officer from Bank of America. She has five beautiful children, 17 grandchildren, and 19 great-grandchildren. She is famous for her mortgage company commercials where she coined the phrase "I'm Bea, come see me!" She has been teaching Sunday School for several years and is an ordained minister. She loves people, her family, and the Lord. Bea preaches at several different churches across the State.